UPDATE!!! 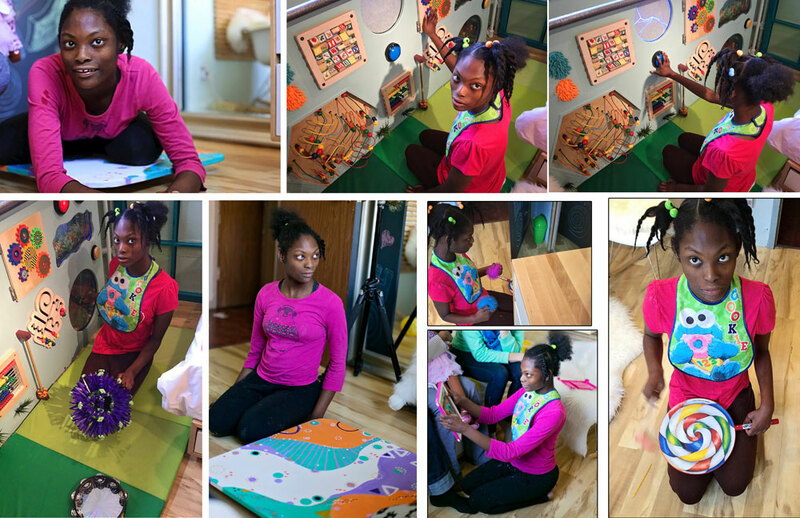 During the weekend of 11/21-11/23/14, a team of Blissful Bedrooms volunteers –TEAM DEANDRA– changed the course of Deandra’s life. So many wonderful people invested in this charitable endeavor – DEANDRA’S ANGELS – making it all possible. We are very excited and extremely proud of the outcome of our 17th bedroom makeover for this very deserving and happy girl. We not only managed to create a visually beautiful, designer bedroom that is worthy of inclusion in any interior design magazine, but one that can also easily be featured in an Occupational Therapy publication as an example of a compact and creative, therapeutic sensory home gym. In only 3 weeks time, Team Deandra did a phenomenal job of envisioning and planning for her bedroom makeover, and then fabricated it over one long weekend (Friday-Sunday). The bedroom is not only a perfect fit for the person Deandra is today, but Team Deandra applied ingenious foresight into nurturing her hidden and unrealized potential for the future. Each member humbly, and passionately, contributed their individuality and specific talents and expertise to the project, which led to a cohesive and seamless team result that is truly extraordinary. We can’t wait to watch Deandra blossom and thrive from all the stimulation and learning experiences this bedroom will provide her with. Thank you Team Deandra and Deandra’s Angels for opening your hearts to this sweet girl. Deandra, our wish for you: may all of your days be blissful in your Blissful Bedroom. Deandra’s Coming Out!! from Blissful Bedrooms on Vimeo. Deandra, or Dee Dee as we affectionately call her, is a beautiful, 15-year-old girl (soon to be 16) with big innocent and compelling, doe-like eyes. Her wide set eyes are actually one of the many clinical manifestations of the rare genetic disorder she has, which is called Cri du chat syndrome, also known as chromosome 5p deletion syndrome. It is a result of a missing part of chromosome 5, which occurs randomly, and it’s name is a French term (cat-cry or call of the cat) referring to the characteristic cat-like cry of affected children. The condition affects an estimated 1 in 50,000 live births, strikes all ethnicities, and is more common in females by a 4:3 ratio. Many individuals with Cri du Chat syndrome have severe cognitive, speech and developmental delays at varying degrees. The life span for a person diagnosed with this disorder is usually normal. When Deandra’s mother and father were given the devastating news that their newborn daughter had this rare disorder, along with the prognosis of a life sentence of profound disability and dependence on them, they each had very different reactions during their conversation with the doctor, and the possible choices he presented. Deandra’s father said, “lets put her in a home” and her mother said, “I will care for my daughter in good times and bad, for all of my days, and you will be the one to find a new home, not her.” This was obviously a very emotional reaction, but one she courageously abided by in steadfastly refusing to institutionalize her daughter, despite the unknown and daunting future she faced ahead, alone. Deandra’s father left their lives shortly after that conversation and has offered no support over the past 15 years, and her mother has compensated by loving Deandra enough for two parents, showering her with unconditional love and loyalty from that day forward. Unfortunately, Deandra’s mom also has little in the way of any other family support and it’s basically just Deandra and her against the world, so to speak. They live in a low-income housing project in the Bronx and mom’s life consists of working while Deandra is in school, and caring for her when she gets home and on the weekends. It is truly awe-inspiring to watch this mother interact with her child with such a joyful, patient, and selfless heart. Being a single mother is no doubt very difficult, but being a single mom to a profoundly disabled daughter who is completely dependent on you for everything, up until now at the age of 15 going on 16, and will be for the rest of your live long days on this earth, has to be overwhelming. Compound that with poverty, social isolation, an aging body that aches with pain and weariness from the years of constant and stressful physical and emotional demands put on it, as well as a plethora of other societal ingredients added to the mix, and well you don’t have to be in this woman’s shoes to be struck by the enormity and depth of such a responsibility! Now, take into account the genuine joy, grace, love and “beyond average human” patience this saint of a lady cares consistently for Deandra with, and the graciousness with which she accepts this unfair fate, and you can understand why we are so determined to do this bedroom makeover for Deandra. We hope to inspire your support to back this charitable effort, as we want to transform Deandra’s humble bedroom as much for her mom, as for her. We know her mom will feel this compassionate act very deeply and it is our sincere hope and intention that they will both derive comfort and healing from the devastating abandonment and betrayal they have experienced. Deandra is a very interesting and unique young lady who seems to be filled with wonder and fascination for life, but unfortunately all she thinks and desires is trapped inside her. She has never uttered a word in all of her 15+ years on earth. Well, that’s not exactly true, her mom says there was one single spoken word occurrence when Deandra was 8 years old and she distinctly said the word “mama,” but unfortunately she has never vocalized that or any others words since. Can you imagine how Deandra’s mom must long to be called “mama” again by her only child and she does hold on to the dream that Deandra will speak one day. Apart from Deandra’s wonder-filled eyes, and her ability to shake her head yes and no and gesture when she is hungry, she cannot communicate with the outside world, and the outside world usually gives up pretty quickly on understanding this mysterious beauty. However, just one look in Deandra’s eyes and it is really impossible to deny that there is a vibrant young girl being held captive, who has so much to express and experience, and who longs to be understood. Deandra currently attends a New York City Special Education public school. She is dependent for most activities of daily living, such as bathing, grooming, dressing and toileting (i.e., she wears diapers). Deandra is able to feed herself when food is placed in front of her. She uses a manual wheelchair and must be pushed by others while in school and in the community. Physically, Deandra is able to stand, walk short distances with support, and is able to transfer independently to and from her wheelchair. However, she does this according to her own internal motivations and timing, which can be very difficult to rely on and inspire in a structured setting. Therefore, while in school, she sits strapped in her wheelchair all day, except for the two times a week when she has therapy. Deandra feels the most comfortable and free when she is out of her chair and on the floor. She typically likes to sit on her heels while engaging in activities (whether it’s eating, painting, interacting with an animal, etc.) but can assume other sitting positions as well. Deandra is amazingly fast and functional at navigating her environment by scooting around on her hands and knees and is able to travel long distances if permitted. Deandra shares many commonalities with some individuals who have Autism as regards her novel and unique needs for sensory input. In spite of these manifestations of her disorder and her severe physical challenges, she is very alert, curious and seems to be utterly intrigued by the world around her. She clearly has deep interest and learning potential, but she has yet to have been provided with consistent and appropriate ways to access, interact and explore the world in a way that is meaningful to HER. This isn’t necessarily because nobody wants to help Deandra, but because most people are simply at a loss on how to do that. She is a complex puzzle of a human being (as many individuals with Autism and other disorders are) and many of the people she encounters during the day just don’t have the knowledge, patience, drive, time, stamina or resources to unravel and decipher the mystery that is Deandra in the limited time they share with her. 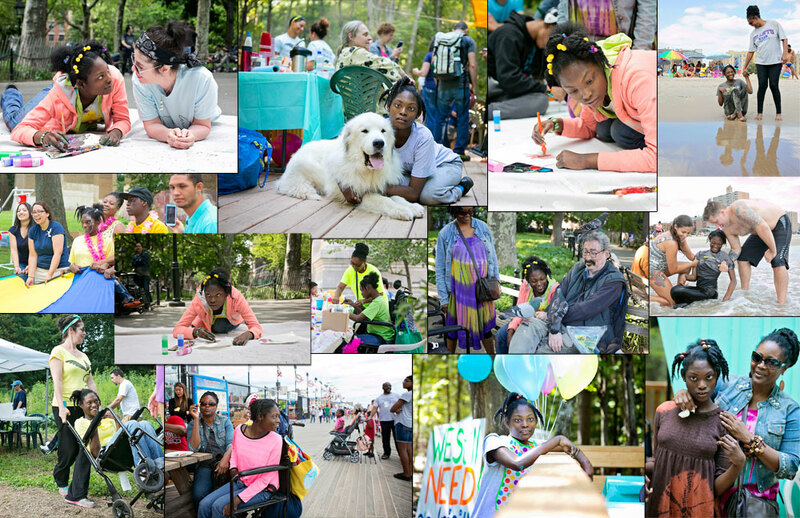 Since Deandra has joined the Blissful Bedrooms community a couple of years ago, her and her mom have been devoted participants in every event we host. We have watched as Deandra gradually reveals herself to us, layer by layer, piece by piece. What we, and her mother, have discovered so far is that Deandra has a passion for painting and what a significant realization that was, because apart from eating her meals, Deandra tends to be very defensive with her hands and reluctant to engage meaningfully in a task. But give her a paint brush and she can spend long periods of time painting independently with incredible focus and attention. It’s actually quite profound and beautiful to watch and evident that she finds the activity calming and fulfilling. Another thing that we (and her mom) have learned about Deandra via our events is that she adores animals – pigeons, dogs, goats, rabbits, llamas – she loves them all. Perhaps it’s because animals understand and see her worth more than humans, who knows, but there is definitely some deep connection going on whenever she has the opportunity to be close to animals. Deandra also enjoys nature, whether it be floating in the ocean with the support of a Blissful Bedrooms volunteer during our last two Beach Day events, or exploring the forest and meeting animals during the two camping trips she has attended at the Blissful Cabin. As if this sweet girl isn’t always surprising us with each new thing we learn about her, her mom shared with us that, of all things, she is a Seinfeld fan and that she laughs hysterically whenever a certain chubby character is on the screen (we have yet to figure out if she is talking about George or Newman, lol). Mom also told us that Deandra loves music – particularly, calypso and reggae – and especially likes the song “No Woman, No cry” by Bob Marley. Nobody can ever say that Deandra is boring, that’s for sure! Of course, we are going to take all of these things we know about Deandra into account when we design her bedroom and do our very best to encourage more revelations! Because she is curious, very sensitive to sensory stimuli, and has the potential to interact meaningfully within her environment when motivated, especially when given the freedom to be out of her wheelchair and comfortable on the floor in her bedroom, we are planning to create a Sensory-themed bedroom for Deandra, which will include a custom-built sensory wall created especially for her. This wall will contain various textures, activities and opportunities for her to access stimuli she loves (such as lights and music) and practice cause and effect relationships. We are also going to make sure that she has the ability to paint in her home on a regular basis. We have lots of other great things in store for Deandra for her Sweet Sixteen/Thanksgiving bedroom makeover and Team Deandra is already hard at work making creative plans and preparing to make Deandra one happy birthday girl. We truly believe that this charitable gift of a sensory bedroom that we are preparing to give Deandra will have such profound significance for her evolution and well being. We know it will enhance her life considerably by essentially providing her with round the clock, self-driven therapy that would not be available otherwise. Please consider helping us to give Dee Dee a therapeutic Sensory Blissful Bedroom. It is the gift that will keep on giving to Deandra and it is quite likely that some of the outcomes and positive results of our innovative intervention can very well be outstanding in her life. Please back our efforts by donating towards one of the items below, or making a general donation of any amount at all via the PayPal button at the bottom of the page. Thank you so very much for considering to be Deandra’s Angel and teaming up with us to be compassion in action for this mother and daughter duo. Please reach out it if you know of other resources and/or have ideas about how we can help Deandra and her mom have an improved quality of life. We are also in need of food donations for the weekend for Team Deandra volunteers, as well as for her Reveal Party on Sunday evening, which will also be a Sweet Sixteen Birthday celebration for Deandra. Deandra’s Introduction Video from Blissful Bedrooms on Vimeo. Thank you to all of the beautiful volunteers – TEAM DEANDRA - who dedicated their hearts, shared their talents, devoted countless hours to Deandra's happiness and went above and beyond to make her special weekend perfect! Thank you to all of the generous ORGANIZATIONS/ BUSINESSES and INDIVIDUALS - DEANDRA'S ANGELS - who supported Deandra’s bedroom makeover by donating funds, services, food and/or materials. This makeover could not have been possible without your help! Thank you to the Companies and Individuals who have adopted Blissful Bedrooms donation boxes, and to the generous and giving customers/people who contributed to the boxes. 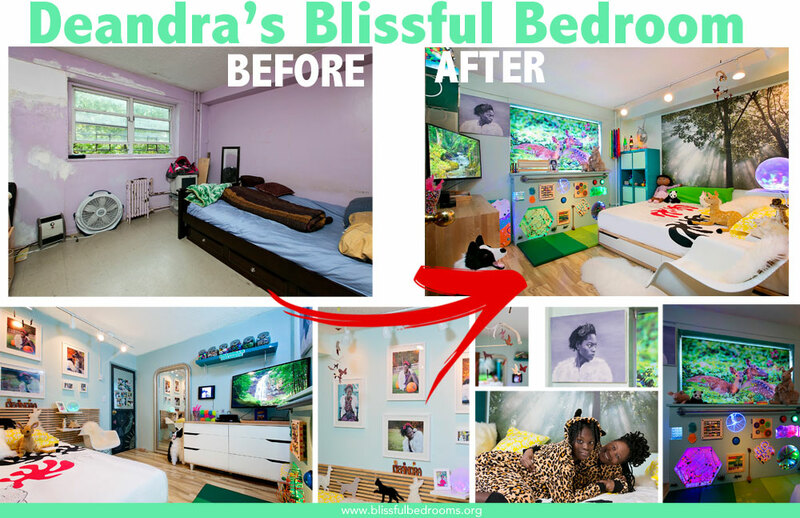 You helped us manifest Deandra's dream bedroom!